Team Canada will compete at the 2019 Pan American Championships in Barranquilla, Colombia, April 12-20. Racquetball Canada will send six athletes to the 2019 Pan American Championships in Barranquilla, Colombia, April 12-20. Playing for Canada will be Danielle Drury (Saskatoon), Erin Geeraert (Calgary), Coby Iwaasa (Lethbridge, Alta. ), Michèle Morissette (Baie Comeau, PQ), Samuel Murray (Baie Comeau, PQ) and Jennifer Saunders (Winnipeg). Michel Gagnon (Longueuil, PQ) is the coach, and Christian Lord (Montréal) is the physiotherapist. Racquetball Canada is aware of the CBC investigation into abuse in Canadian sport and thank those who have worked to draw attention to this issue. This comes at a time when Racquetball Canada is heavily invested in policy review and the development of processes and strategies that will guide our operations including responsible coaching, safeguarding athletes and participants, redefining our values and improving systems for communication and coordination across Canada. The conversations leading up to and prompted by the investigation will provide us with even more opportunity to ensure we implement best practices and learn from other sport organizations as they do the same. Racquetball Canada is committed to working with our stakeholders, with organizations who are leaders in change and with our members and provincial associations. It is important that together we support the safest environment possible within our sport at all levels and as a member of Canada's sporting community. Racquetball Canada is inviting nominations for the Racquetball Canada Hall of Fame and Awards Program. Deadline for nominations is January 31, 2019. The Hall of Fame honours those who have distinguished themselves as an exceptional athlete or a member of an exceptional team at the national or international level and those who have impacted the sport nationally or internationally as a sport builder such as a coach, official, sport leader, administrator, etc. Racquetball Canada's Award Program is comprised of six awards which recognize athletes, builders, coaches and volunteers. The awards include the Ivan Velan Award and the Susan Livingston Award, which honour two fo the sport's distinguished past members. Racquetball Canada is committed to recognizing those who have contributed to the sport. We receive nominations for very worthy recipients from provincial associations, clubs and individuals annually and we hope that you will consider nominating someone you feel is deserving of this type of recognition. Racquetball Canada has announced its four tournaments for 2018-2019. The 1st National Team Selection Event - November 23-25, 2018 in Valleyfield, Québec. The Junior National Championships - April 24-27, 2019, Valleyfield, Québec. The National Championships - May 19-25, 2019 in Langley, British Colombia. For more information, please contact Adrian Webb. Racquetball Canada is looking for proposals for hosting its tournaments in 2019-2020. The 1st National Team Selection Event will be in November 2019, and proposals should be received by 30 October 2018. The 2nd National Team Selection Event will be in February 2020, and proposals should be received by 31 January 2019. The Junior National Championships will be in April 2020, and proposals should be received by 31 March 2019. The National Championships will be in May 2020, and proosals should be received by 30 April 2019. For proposal information please contact the Administrator of High Performance & Sport Development. Jacques Seguin uses racquetball to help him deal with his Parkinsons condition. Look at how he does it at his website. Also, Nova Scotia Racquetball has made a video of how people use racquetball to help them deal with their Parkinsons condition. Racquetball Canada has launched the - www.letsplayracquetball.ca website - to help introduce racquetball to boys and girls (7-14 years) both on racquetball courts and away from racquetball courts. 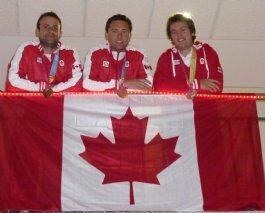 Racquetball Canada is on Follow us! Like the Racquetball Canada Facebook page!